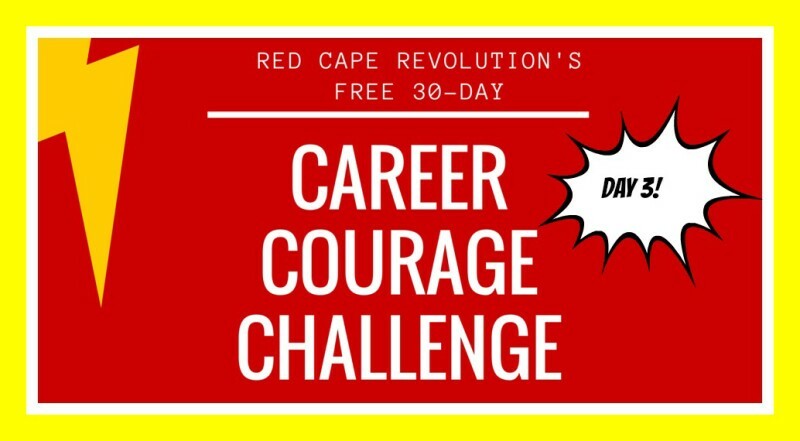 Welcome to the third day of our 30-Day Career Courage Challenge! Each day, I’ll be sharing a short challenge you can take to help build your courage and your career. Plus, I’ll be taking the challenges along with you—watch for my notes in the Comments, below, as well as on Facebook and LinkedIn, so chime in! YOUR CHALLENGE TODAY: Who’s in your life at work right now who you really don’t like very much? Who ticks you off? Who frustrates you? Picture their face in front of you. Now, look at them closely. What is something about them that makes them great? Wuuuuuh?? Yes, I’m asking you to find the gold in someone you may not be inclined to see as positively as the people you naturally like and connect with. It takes courage to think positively about someone you don’t really like. Because no matter who they are, there is SOMETHING good about them that you can find to recognize and even admire. Bonus points if you actually TELL someone–including the person you don’t like that much. Who knows–it might turn your entire relationship around and create a change for the better for you, and your career. In the past, I worked with someone who often drove me crazy. This person was snarky and very passive-aggressive. And there was nothing I could do to fix the situation. I chose to just ignore it. Some times that worked, and sometimes that drove the person to more overt behavior, trying to get a reaction. BUT….this person was a phenomenal teacher. Incredibly organized. Resonated with students, the vast majority of whom respected this person, and even 10+ years out, would tell me how important this person was to them during and after college. In some ways that made it harder because I believed this person’s behavior stemmed from insecurity — and she had no rational reason to feel insecure! But…. I had to learn to not take things personally because they WEREN’T personal — at least, not centered around me. And I actively took the time to think about and decide what my limits were, and only confronted when those limits were crossed. Daily, I reminded myself how genuinely this person cared about the students, and mentally listed all the contributions that made the person a valued and valuable part of our team. By constantly reminding myself about how valuable this person was to our team, and to me, it kept things in perspective. And since I had already established in my mind what the acceptable limits were, I was able to keep the behaviors in perspective and not overreact myself. I also made a point of sharing any positive comments I had heard abou the person with that person on a regular basis. I realized that I often got so frustrated that I only focused on the negative, and never took the time to share the positive. J, I think you already aced this Career Courage Challenge! Isn’t it funny how much can change when we take time to look at what might actually be good about someone we don’t like? I love that you went the next step and shared the positive, too–I’m sure that kind of generosity has and will continue to come back to you, too. Thanks for taking time to share thoughts on this Challenge! Okay, I’m taking the challenge. For me, I appreciate that this person is really dedicated to her work, and cares deeply about achieving success for her customers and her business. I admire the passion and discipline she applies all the time, even when I don’t always agree with the outcomes. Thanks, Chantrise, for sharing your story! Amazing, isn’t it, how we can see different sides of the same person when we’re looking for it? Appreciate you taking the challenge with me! I have a colleague, who is a person who is highly focused on getting ahead. He is driven, which is a really great quality. The part that I don’t like is that he is totally self serving and will use most anyone to gain his next rung in the ladder. But, he is focused and driven. And I admire that determination and focused life. I would like more of that in my life, but I also want to avoid the negative of “using others for my own gain.” My values are such that to do this, would be a violation of a core belief.